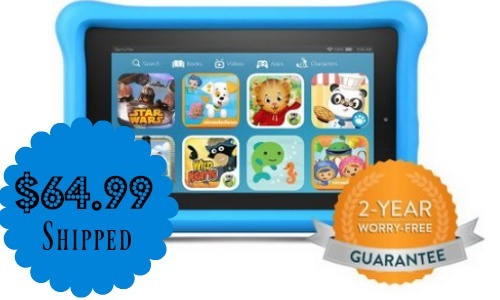 Amazon currently has a great deal on the Fire Kids Tablet! You can grab one for $64.99 shipped. It’s the lowest price we have seen and most likely will see, so go ahead and grab the tablet if you’re looking for one. This deal is valid on the blue cover 8 GB style. Prices subject to change. Shipping is FREE with Prime. $1 Olive Garden Kids Meal – Last Day! Flirty Aprons $5 Sale + Free Shipping on Any Order! Yankee Candle Coupon | BOGO Jar & Tumbler Candles! Kohls Triple Stacking Coupons: Bed & Bath Deals! Free Darn Good Yarn $10 Gift Card! Humm Kombucha: $1 Each at Target! FREE Small Blizzard at Dairy Queen!